Everyone knows about the law of gravity. In finance, the closest thing we have to the law of gravity is the law of risk and return. This law simply states that the higher the potential return is on an investment the greater risk you are taking. The primary risk I will define as the risk or likelihood that you don’t get the return you were expecting on an investment. Investors are focused on return more than the risk. That is because it’s a number that they can compare to another return number. The first and only question investors ask is always “how much does that pay”? For many investors this single question is usually the only criteria that determines if they will purchase a given product. This is because risk is not stated in a way everyone can understand like returns are. And it is not easy to determine because there are many categories of risk. And even if you determine the risk of an investment today it may change over time so most investors just ignore it. So where can you put your money where there is no risk? How about under your mattress? Well, what if your house burns down, a tornado hits or a burglar breaks in? The point is there is no 100% safe place to keep money and the safest places earn little or no return. The question is how much risk are you comfortable with? You must take on some risk but there is a tradeoff between risk and return. In finance we use short term 3 month U.S. Government Treasury securities as a “risk free” investment. Three month T-bills are paying about .3% the day I wrote this column. Any investment with a return above that involves some kind of higher risk we call a risk premium. So if you are presented with an investment that pays 5 to10% and the salesperson represents that is a guaranteed (risk free) rate what would you do? Many investors hear the word guarantee and that’s it. They are in. No further due diligence necessary. If someone says the word guarantee your antenna should go up immediately. Remember the law of risk and return? 5% is way above .3%. Something is not right. First, what kind of guarantee is it? There may be limitations within the guarantee. And second, a guarantee is only as good as the person or company making it. If they are paying 5 to 10% that guarantee is probably going to have very high fees or have more holes in it than Swiss cheese. Many investors don’t know what risks they are taking. For example, I have seen investors describe themselves as very conservative but have a portfolio overflowing with high yield bonds paying 5 to 10%. High yield means junk bonds that are non-investment grade bonds with a higher risk of default. They have no idea how dangerous high yield junk bonds are but they say CD’s are paying nothing so they reach for more interest. This tells me they are expecting a high return without taking much more risk than a CD would have. You can’t have it both ways. It is going to be a very bad day when the law of risk and return catches up with them. What you want to remember is – use the return you are being offered as a gauge for the risk you are taking. The higher the interest rate the higher the risk. An investment with a 3% return is going to be more risky than one with a 1% return. If you don’t know what those risks are you better find out. 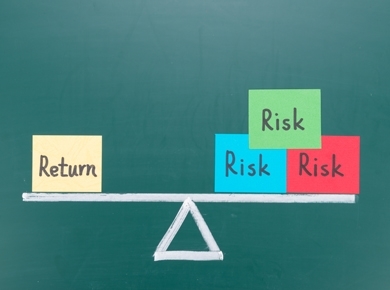 The amount of risk an investor is willing to take is called their risk tolerance. In my years of helping people no two investors see risk quite the same. But in general the amount of time until you need the money generally determines the risk you should be willing to take. The longer you have the more aggressive you should be. The shorter the time frame becomes the more conservative you should be. So your risk tolerance typically changes over time. A person’s risk tolerance can also change with their emotions and the excitement or fear of markets rising and falling. Typically investors get more aggressive when markets are up and more conservative when markets are down. This kind of behavior is not good. You should have a portfolio that suits your base risk tolerance and stick with it until your timeframe for needing the money changes. Bill Oldfather is a fee-only financial planner and investment advisor. Oldfather Financial Services is an SEC Registered Investment Advisor based in Kearney NE. Email to [email protected].